The wind was blowing pretty hard today putting all kinds of dust and other stuff in the air. 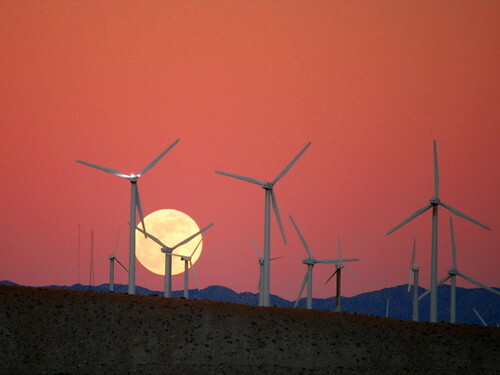 At dusk I decided it was time to head home and as I was driving down Snow Creek Road I noticed the moon rising behind the wind turbines. Each of these units is a horizontal-axis wind turbine (HAWT). They are called horizontal-axis because the main rotor shaft is horizontal. The blades are attached to an electrical generator at the top of a tower and they must be pointed into the wind. The units have a gearbox so the generators can turn at a speed higher than the relatively slow blade rotation speed. The blades are about 150 feet (46 meters) long and the towers are about 300 feet (91 meters) tall. That makes them really huge and really expensive to transport and assemble in the field. Many of the wind turbines are smaller than these units. Coolness factor aside, the wind turbines are a scam. The turbine owners make money because of guaranteed government subsidies and tax credits (i.e., paid for you and me). Most of us have a surcharge on our electric bills to pay for "green" energy. A megawatt of wind-generated electricity costs about 11 or 12 times as much to produce as a megawatt of coal- or oil-generated electricity. The government subsidies are more vital to the wind industry than the wind is. Without the subsidies, wind cannot compete against coal and oil. The Atlanta Journal-Constitution (July 9, 2008) pointed out that, "In 1999, 2001 and 2003, when Congress temporarily killed the credits, the number of new turbines dropped dramatically." When the subsidies stop, the turbines are more or less abandoned until the subsidies resume. On top of everything else, wind turbines generate their energy at the wrong times. A quick weather lesson . . . High pressure weather systems bring cold winters and hot summers and low wind levels. Low pressure weather systems bring warmer winters and cooler summers and lots of wind. These meteorological realities mean that wind makes its biggest contribution when demand is lowest and its smallest contribution when demand is highest. Wind was a great source of power in the Middle Ages. But we have far better technology now. If the government did not force wind power on us, we wouldn't have it. It's just not practical. Update 2: This photo was used to accompany an article by Paul Ryan, Newcastle wins $20 million Clean Energy Innovation Centre, on February 20, 2009. Update 3: This photo was used to accompany an article, Careers, on the Land Agent Services LLC website on March 10, 2009.